This guide will help you understand why embedded servers are gaining popularity. We will discuss the different options that Spring Boot supports - Tomcat, Jetty and Undertow. What is an embedded server? Why are embedded servers getting popular? What are the different embedded servers that Spring Boot supports? How do you switch from one embedded server to another? Think about what you would need to be able to deploy your application (typically) on a virtual machine. What if we want to simplify this? How about making the server a part of the application? You would just need a virtual machine with Java installed and you would be able to directly deploy the application on the virtual machine. Isn’t it cool? This idea is the genesis for Embedded Servers. When we create an application deployable, we would embed the server (for example, tomcat) inside the deployable. For example, for a Spring Boot Application, you can generate an application jar which contains Embedded Tomcat. You can run a web application as a normal Java application! Embedded server implies that our deployable unit contains the binaries for the server (example, tomcat.jar). 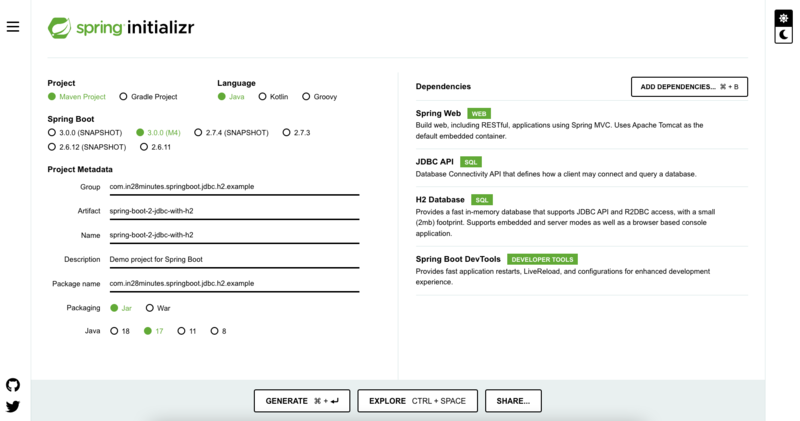 We have included Spring Boot Starter Web in our dependencies when creating the spring boot project. You can see that by default Starter Web includes a dependency on starter tomcat. Starter Tomcat has the following dependencies. Starter Tomcat brings in all the dependencies need to run Tomcat as an embedded server. When you run SpringBootTutorialBasicsApplication.java as a Java Application, you would see that the server would start up and start serving requests. You can see that tomcat has started by default on port 8080. When you do a ‘mvn clean install’ on the project, a jar artifact named spring-boot-tutorial-basics-0.0.1-SNAPSHOT.jar is generated. This jar can be used to run the application on any machine where Java 8 is installed. Remove the existing dependency on spring-boot-starter-web and add these in. server.compression.enabled=false # If response compression is enabled. server.context-path= # Context path of the application. server.display-name=application # Display name of the application. server.error.include-stacktrace=never # When to include a "stacktrace" attribute. server.error.path=/error # Path of the error controller. server.error.whitelabel.enabled=true # Enable the default error page displayed in browsers in case of a server error. server.port=8080 # Server HTTP port. server.servlet-path=/ # Path of the main dispatcher servlet. server.jetty.acceptors= # Number of acceptor threads to use. server.jetty.max-http-post-size=0 # Maximum size in bytes of the HTTP post or put content. server.jetty.selectors= # Number of selector threads to use. server.ssl.ciphers= # Supported SSL ciphers. server.ssl.client-auth= # Whether client authentication is wanted ("want") or needed ("need"). Requires a trust store. server.ssl.enabled= # Enable SSL support. server.ssl.enabled-protocols= # Enabled SSL protocols. server.ssl.key-alias= # Alias that identifies the key in the key store. server.ssl.key-password= # Password used to access the key in the key store. server.ssl.key-store= # Path to the key store that holds the SSL certificate (typically a jks file). server.ssl.key-store-password= # Password used to access the key store. server.ssl.key-store-provider= # Provider for the key store. server.ssl.key-store-type= # Type of the key store. server.ssl.protocol=TLS # SSL protocol to use. server.ssl.trust-store= # Trust store that holds SSL certificates. server.ssl.trust-store-password= # Password used to access the trust store. server.ssl.trust-store-provider= # Provider for the trust store. server.ssl.trust-store-type= # Type of the trust store. server.tomcat.accept-count= # Maximum queue length for incoming connection requests when all possible request processing threads are in use. server.tomcat.accesslog.directory=logs # Directory in which log files are created. Can be relative to the tomcat base dir or absolute. server.tomcat.accesslog.enabled=false # Enable access log. server.tomcat.basedir= # Tomcat base directory. If not specified a temporary directory will be used. server.tomcat.max-connections= # Maximum number of connections that the server will accept and process at any given time. server.tomcat.max-threads=0 # Maximum amount of worker threads. server.tomcat.uri-encoding=UTF-8 # Character encoding to use to decode the URI.